This recipe is meant to be enjoyed in a cool, comfortable weather. Somebody has that weather somewhere but not in the Philippines, that's for sure! It's scorching hot these days but I think it's a recipe worth sharing and worth knowing. In a stainless steel bowl, combine egg yolks, zest and juice of lemon, garlic and mustard. Whisk until it gets lighter in color and a bit thicker in consistency. With a fork, break apart the anchovy fillets in a separate bowl. While whisking the egg mixture vigorously, drizzle in the olive oil until mixture gets thicker and combines well. Whisk in the anchovy fillets and Parmesan cheese. Season with salt and pepper. In a heavy-bottom stock pan or dutch-oven casserole, heat olive on medium-heat. Sauté the onions and fennel bulb first until it sweats, about 3 minutes. On the Dutch-oven casserole, brown the Vigan longanisa meat, about 3 minutes and add in the garlic, red pepper flakes, cayenne pepper and shrimp bouillon cube, sauté for another minute. Pour in the white wine to deglaze the pan, making sure to scrape the bits stuck on the bottom of the pan. Let alcohol evaporate, about 2 mins. Sprinkle in the saffron threads and add the water and canned tomatoes. Season with salt and pepper. Bring to a boil and let simmer for 15 minutes on low heat. Add the mussels and simmer for another 15 mins or until shells are about to open. Add shrimps and squid and simmer for another 10minutes. Check if you need to season more. Just before serving, sprinkle over the lemon zest and fennel fronds. Serve while hot in a bowl topped with tortilla crisps and some of the lemon-anchovy aioli. I bought the tortilla crisps from Village Gourmet which can be found in some supermarkets. You can also make your own by purchasing tortilla wraps, cutting it into pizza wedges and baking it in a 350 degree pre-heated oven for about 5-8 mins. You can find fennel bulbs in Santi's. Saffron threads were a gift from Dubai but it can also be found in Santi's or in groceries. 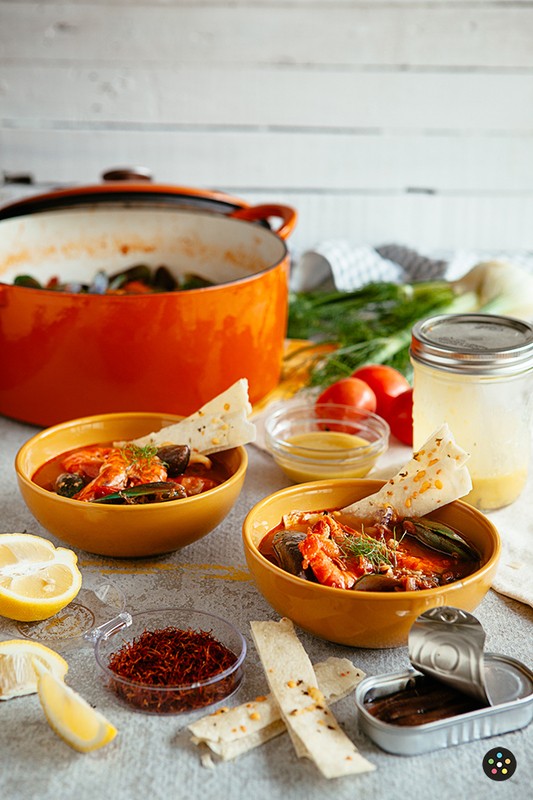 Recipe for Spicy Seafood Stew on Pepper.ph!